Written in 1982, this is a collection of Mike Grell's original run on "Sarslayer. 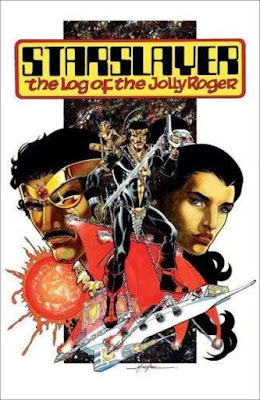 A space opera about a Celtic barbarian who is snatched from death and transported to the future to helm a pirate ship, "The Jolly Roger". The two Forewords by the author and illustrator who took over the reins after Grell's run was finished are very interesting in telling about Grell and how "Starslayer" came to be. From the early '80s, this is classic stuff and a rip-roaring adventure of sailing through space visiting other planets on a mission to save what remains of mankind. The art is old school, bright and bold, and a delight to this original reader of 70s/80s comics. I thought the story was a lot of fun while being quite serious and dramatic at times along with engaging characters. Hopefully, a second volume will come out compiling the rest of the series.